As I want to discuss in short I do not want to elaborate this lesson. Lets we discuss about the Definition of syllable or What is syllable? You will get more about syllable from here as like as - Kinds of it and details. Syllable is a word or a part of a word uttered by a single effort of the voice. Kinds of Syllable in English grammar: Syllables are four in number. Mono-syllable is a word which contains only one syllable in a word. Example:- It, And, But, Or, etc. Di-syllable is a word which contains two syllables in a word. Brother = Bro + ther. Teacher = Tea + cher. Tri- syllable is a word which contains three syllables in a word. Education = Edu + ca + tion. Favourite = Fa + vour + ite. Poly- syllable is a word which contains more than three syllables in a word. Calculation = Cal + cu + la + tion. Satisfaction = Sat + is + fac + tion. 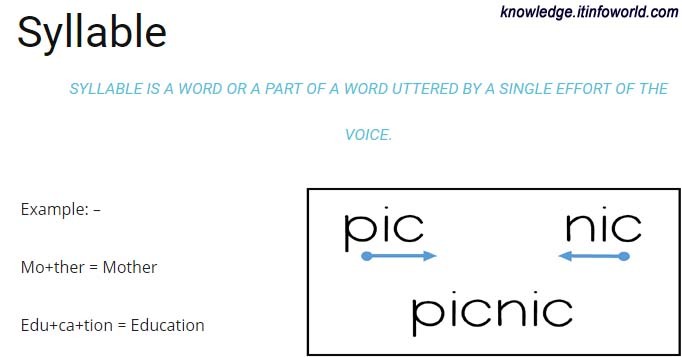 Hope you have got clear idea about Syllable in English Grammar after reading this short article.